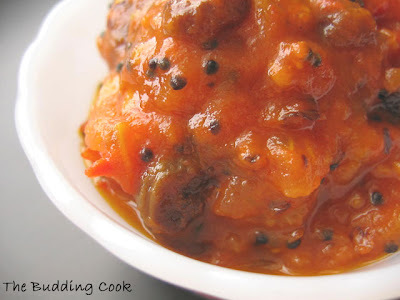 A few days back, I saw this recipe on Arundathi’s blog and wanted to make it right away. The simplicity of the recipe and the fact that it only called for a handful of ingredients was what drew me towards it. I have found that I usually only go for recipes that are quick and easy, and do not have an ingredient list that is a mile long. I finally got a chance to make tomato oambal today. Heat the oil in a pan and add the mustard seeds followed by the red chilli flakes. Add the raisins, chopped tomatoes and salt and cook till the tomatoes turn to mush. Add the jaggery and continue cooking on medium heat for a good 20-25 minutes till all the water evaporates and the mixture thickens. Add some lemon juice at the end of the cooking process. This was my very first taste of the cuisine of North-East India, and I have to say that I simply loved it! I used the tomato oambal as a sauce for some noodles that I made for dinner tonight. Off this goes to Nupur for the July edition of the Monthly Blog Patrol. The theme this month is Less is More. 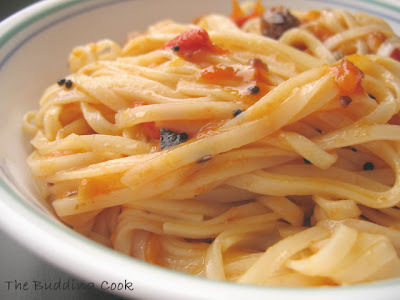 Noodles with Oambal looks yummy and its a brilliant idea to add it as a sauce..
A sweet and tomatoey sauce - cool. I think it'll be a hit with kids too. Those mustard seeds almost look like passion fruit seeds! 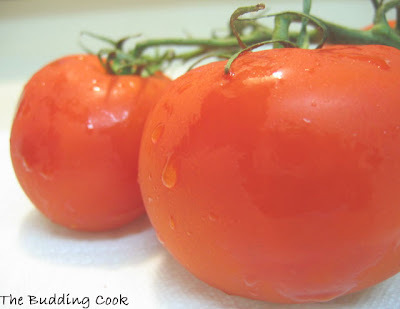 loved this tomato oambal, its so simple to make and can add this to pasta etc. Good one. Saw this at the RCI:NE round-up. Looks lovely. Great idea of serving it up with noodles, maybe even pasta. I usually prefer this kind of recipes too, especially when in a hurry. Love the idea of combining some raisins and chilli flakes for a pasta sauce! Bookmarked! What a great dish to submit to Nupur's event. A very refreshing choice for the summer months. Sweet, spicy and simple. Love the novel idea of noodles. Just give me my gravies over starch, please! You DB girl- your creations month after month just amaze me! Laavanya- it would...just cut down on the chilli addition if you ever plan to make it for A. H found it a little too sweet, so he added some more heat! Thanks to Bhags and Arundathi, I can say I tried something from the NE part of India. Richa- I liked how they were used here. :) So y r u posting so infrequently these days? this looks and sounds (oambal) so yummy! really different. That does sound quick and easy and good. ombal. what does that word mean? the sauce looks saucy?